When we decided to visit Mount Bromo, we had already spent an entire month in Java and hadn't done any trekking. We needed to fix that. 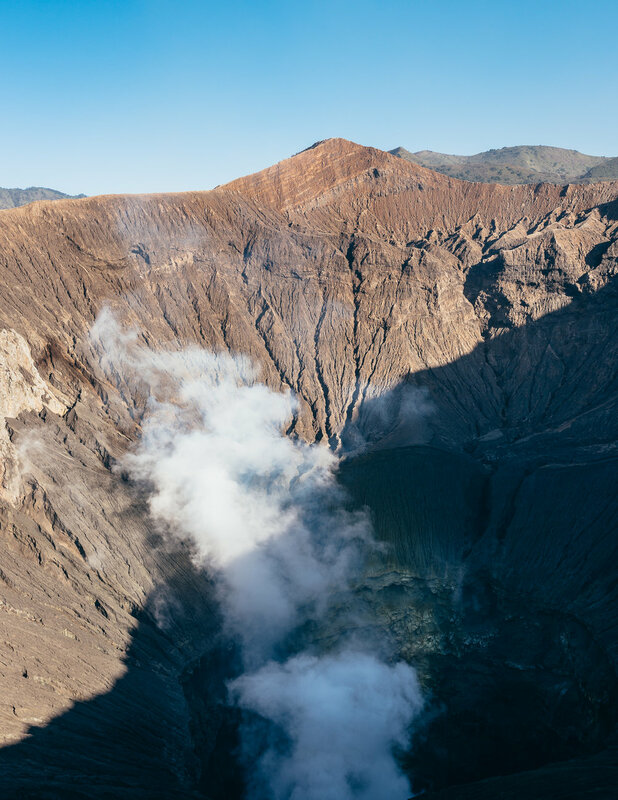 Mount Bromo is probably the most well-known active volcano in Indonesia, and a very easy trek by most standards (perfect for us!). So, without much preparation or planning, we decided to buy a train ticket to Probolinggo, where the adventure starts. The good thing about not having any expectations when you visit a place is that you're bound to be surprised when you get there. And in our case, that is exactly what happened with Bromo. We were amazed with the scenery throughout entire bus trip and excursion, up to and including the unforgettable sunrise from the top of Mt. Penanjakan. The central point of departure towards Mount Bromo is within the city of Probolinggo, which is about 28 miles north of Cemoro Lawang, the village that surrounds Mount Bromo. 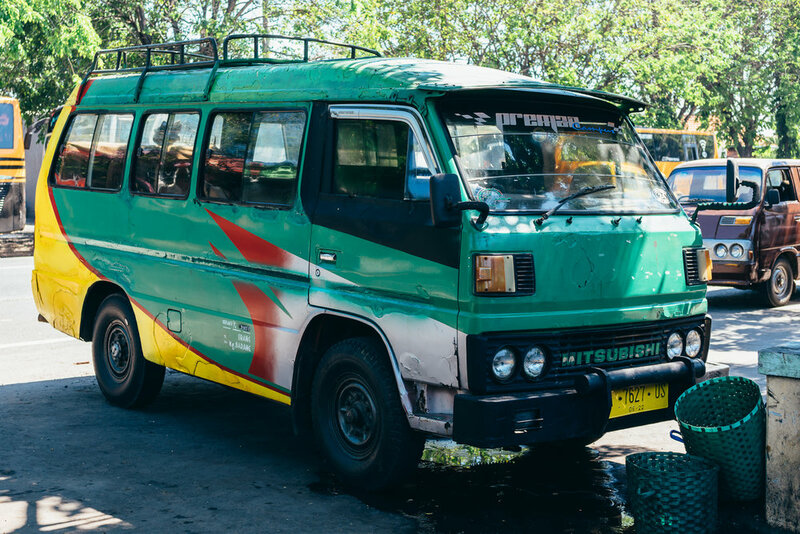 From any point in Probolinggo, you can take what's known locally as a “bemo," a shared minivan that will take you to the bus station (Terminal Bayuangga) where you will then catch a mini-bus that takes you to Cemoro Lawang. This bemo should cost 5,000 rupiah – always make sure of that before hopping on! This is what the mini-bus that will take you to Cemoro Lawang looks like. Once you’re outside the bus station, you'll find several mini-buses on one side of the entrance that are destined for Cemoro Lawang. Don’t go with any agents or people trying to sell you tickets, and make sure you pay the driver directly once inside in the bus (or when you get to your destination, depending). If you feel lost and need information, go into the station and visit “Toto Travel.” They'll provide you with all the information that you may need, free of charge and without any tricks or hard sells (a rarity!). Once you find your mini-bus, it's time to wait until it gets full. They leave when the bus reaches capacity (15 people), bringing the cost per person to 35,000 rupiah. For our trip from Probolinggo to Cemoro Lewang, we had a total of 13 people, so we all agreed to pay an extra 5,000 rupiah each rather than wait for two more people to show up. The waiting game. Fortunately, we didn't have to wait long for the mini-bus to get full, but others had already been waiting for hours. This trip takes about an hour-and-a-half, and although the bus can get pretty packed, it is worth putting up with considering how cheap the trip is. Speaking of cost, the other option is to rent a private car – which will always cost much more (approximately 650,000 rupiah per car, which is what our guesthouse at Probolinggo was offering). Getting into the village, you may be asked to pay 10,000 rupiah, a fee that people in Cemoro Lawang have invented and charge some tourists to get in. We were lucky that nobody made us pay on the way in, but keep that in mind so you're not surprised! Also, ask the driver to take you to the bus stop where your trip is supposed to finish; sometimes they will try to drop you off before actually getting to the end of the journey. If you want to see Mount Bromo at sunrise, your best option is to spend the night there. The first thing to know is: There are probably no good places to do this. We stayed at “Rudi Homestay,” but we can't say anything great about it (other than maybe the view we had was nice, pictured below). And if you look up reviews of the other homestays in Cemoro Lawang, you will notice that ALL of them (or at least the ones that were available to us and were nearby) have negative reviews. Know this upfront and just remember that you will really only be napping for a few hours, as you have to wake up at around 3 am anyways. We booked the cheapest one we were able to find and it was fine for us. If you're curious, you can check out the guesthouses near Mount Bromo with the widget down below. Visit Bromo and the Sea of Sand for FREE While Avoiding Crowds! Perspective from the top of Bromo. You can see the Hindu temple on the left side of the photo. We got to Cemoro Lawang around 1 pm, had lunch to recharge our batteries, and then immediately started our trek to Mount Bromo with a group of friends that we made on the way there. If you do it in this order, you will avoid the crowds of the people, who mostly do the sunrise first and then immediately march towards Mount Bromo in the early morning. Instead, go visit Mount Bromo through the Sea of Sand in the afternoon, and check out the sunrise on the following day. So you've avoided the crowds of people – but how do you get in for free? 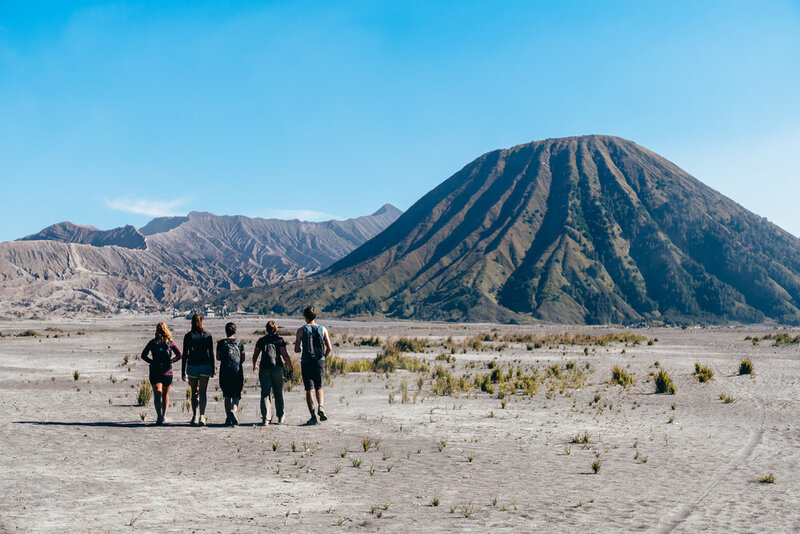 Most people visit Mount Bromo with a package that includes transport and the entrance fee, but there's a free way of getting into Bromo on your own and without a tour! Trust us when we say that a tour is not necessary to get to the crater. A couple steps to the right of "Cemara Indah Hotel" (and restaurant), there is a clear path that leads you down to the Sea Sands (the path is pictured below!). 10 minutes down this path and you will be on the Sea of Sand and on your way to Mount Bromo. Although, it isn't the official entrance, people use this path everyday without any issues. Walking through the Sea of Sand is a really fun experience; if you step with a little force, you will see fine sand rising up around your foot, creating a translucent blanket of dust that makes for some fun photos! This part would take you around 20-25 minutes, but if you’re like us and stop to take tons of pictures, expect it to take a little bit longer! Once you pass the impressive and in-the-middle-of-nowhere Hindu temple, you will be arrive at the base of the volcano. From here, you will be offered to take a ride by horse – but please, don't do it. Horses are not taken care of properly here and it’s easily accessible by foot (only about another 15 minutes!). Lastly, you'll find the not-so-friendly stairs that take you directly to the crater. This was my least favorite part of the trek, but I have to admit: I have the physical conditioning of an 8 year old. Dead tired or not, the effort is well worth it! Stairs to get to the crater of Mount Bromo. Once you’re at the top, you very quickly realize that security measures up there are practically non-existent, so be careful when you're walking around the crater. In any case, the stunning views and the high you get from being at the top of an active volcano is just amazing! Smoke coming out of the crater. Finally, on our way back we made sure to use the same unofficial access point described above to avoid any possible problems at the main entrance. The second day is all about watching the sunrise at the top of Mt. Penanjakan. To get there you have two options: either walk up, or hire someone to drive you up on a jeep (or possibly even a motorcycle!). Walking the path will take around 2 hours each way, more or less; it is a paved road, but you will need a flashlight because everything will be pitch black at that time (with just the moon and the stars lighting the way). We set our alarm for 2:45 am, and although we planned on walking up with our group of friends, Robert and I decided to take a jeep ride up at the last minute because I wasn’t feeling well. Steps from the entrance of our guesthouse, we luckily found a driver with whom we could negotiate for a ride. Most tourists go visit Mount Bromo with the jeep after the sunrise; since we had already gone the day before, we only needed the ride to the viewpoint and back. After bargaining, we were able to bring it down to $6 per person. A motorcycle probably would have been cheaper, but since we decided this at the last minute, we were happy with what we got. He took us there and was ready to take us back to the guesthouse at the hour we chose (after the sunrise), with the bumpy, uphill ride taking 15-20 minutes. So, learn from us: If you decide to take a jeep up, try to arrange the price and time the day before your trip so that you get a better price. One more tip: Once you get to the viewpoint, you'll notice that there are different levels. Although most of the people go straight to the top, we decided to stay at a lower viewpoint that made the experience more authentic and intimate (no crowds and flashes, as there were only 4 of us) and we essentially had the same stunning views! Sunrise panorama from Mt. Penanjakan around 6:30 am. Waiting for the van to get full to go back to Probolinggo at 8:00 a.m. Independently of where you're going next, unless you have a private driver, you will have to go back to Probolinggo to get a bus or train to then get to your next destination. If you’re leaving after sunrise like we did, your best option is to go to the main stop (the same place where the bus originally left you when you came in from Cemoro Lawang) around 8 a.m. This is the time most people will be leaving the village and it won’t be difficult to get the 15 people needed for the mini-bus to leave. Once you’re in Probolinggo, if you didn't pre-book your bus/train tickets and decide to take a bus, be careful at the station with scams they'll try to pull! Check out what happened to us and learn how to keep it from happening to you!